Rigid heddle looms may not be fancy or complicated, but do not be deceived. You’re not going to weave acres of jacquard, but don’t think placemats, table runners, scarves and hand towels are your only options on a rigid heddle loom. Two years ago when I bought my little loom I had no idea that with some experimentation, practice and patience I’d be able to make a garment from fabric I’d created. For one thing, the idea of cutting my handwoven cloth terrified me. Also as relatively inexperienced seamstress, I wasn’t confident I could create a wearable garment. 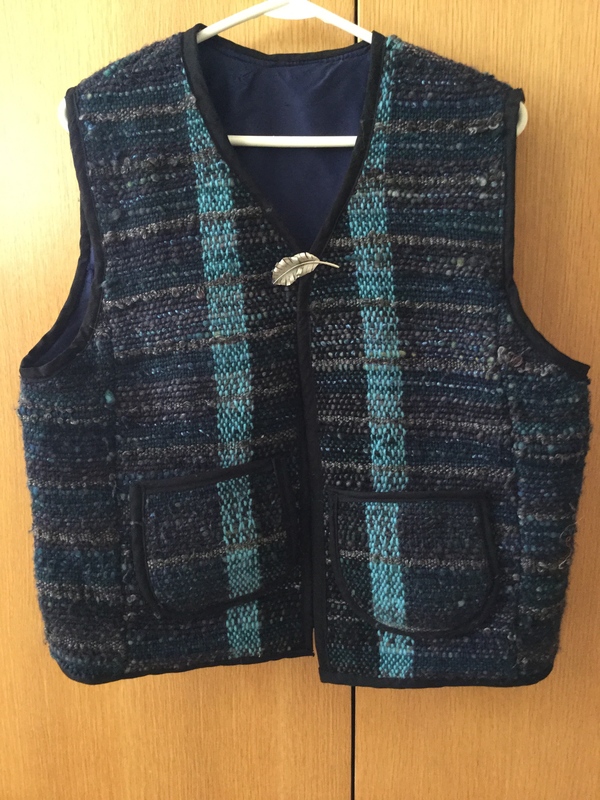 I took the small amount of fabric I’d woven on a 20″ (50 cm) Ashford Knitter’s Loom up to Clacton-on-Sea for a lesson in sewing with handwoven with Sarah Howard. Sarah, along with Elisabeth Kendrick, is the author of Get Weaving, which I blogged about earlier this year. 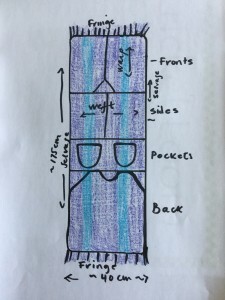 Sarah helped me find a pattern that would work with the 175cm of fabric I had. We used a commercial paper pattern to get an idea of size and shape and then made some modifications for fit and the fabric. The next step was to make a paper pattern to use to then sew up a calico to see how the garment looked. I used some denim for the calico. It allowed me to see where changes were required (in the armpits!). Once that was done, I went a way with instructions to test out the pattern on store-bought fabric. Sarah says it’s important to do a trial run before diving into your handwoven. Lots of issues can be sorted out on the sample piece. For example, I found I needed to change the shape of the side pieces slightly. Making a sample made me think about bias binding and lining too. 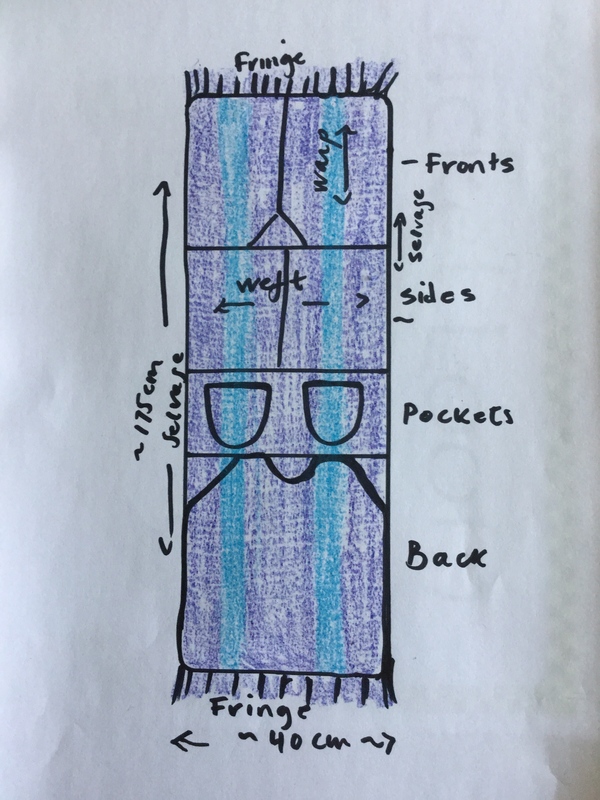 My sample looked pretty good, but I realised I would have to do the pockets a bit differently on the final piece–ie with biased binding and the fabric backed by iron-on woven interfacing. 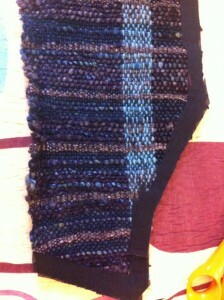 I also decided that gold/black lining would not look good with the handwoven and went for a solid blue silk. – Make sure all the pieces fit. Measure the length of fabric without the fringe. – Think about the best use of your fabric’s selvedges and hemmed ends to reduce the potential for fraying and binding. – Make a note of the direction of warp and weft in your fabric. How does that influence how you place your pattern on your fabric? You probably want all your pieces going with the warp. I was careful to place the pockets to match up with the stripes on the two front pieces. The next step was to cut out the pieces.Once I did, I carefully applied strips of iron-on woven interfacing to the fabric to prevent fraying. Then I zig-zag stitched over that. I sewed together the fabric pieces as well as the lining. I didn’t sew in the lining, but bound the piece together all at once with bias-binding tape. I made it myself, which wasn’t difficult, but it was time consuming. However, store-bought bias tape is pretty poor so I do recommend taking the time to make it yourself. A few things to keep in mind when sewing with handwoven. – Remember your woven fabric may be quite thick. How is that going to impact your seams? Will your garment work well with chunky seams? – Use iron-on woven interface to prevent fraying. It also makes it easier to sew. – Go slow! Once you machine sew handwoven fabric, it’s really hard if not impossible to pick out without destroying the fabric. – Handwoven is stretchy. Think about how that might cause difficulties when sewing up or when putting in a lining. Having seen this vest in person, I can only say that these photos don’t really do it justice. You took a textured, variegated fabric and made it into a neatly tailored garment. And the stripes on the pockets line up! Magnifique!! Thanks Sal! 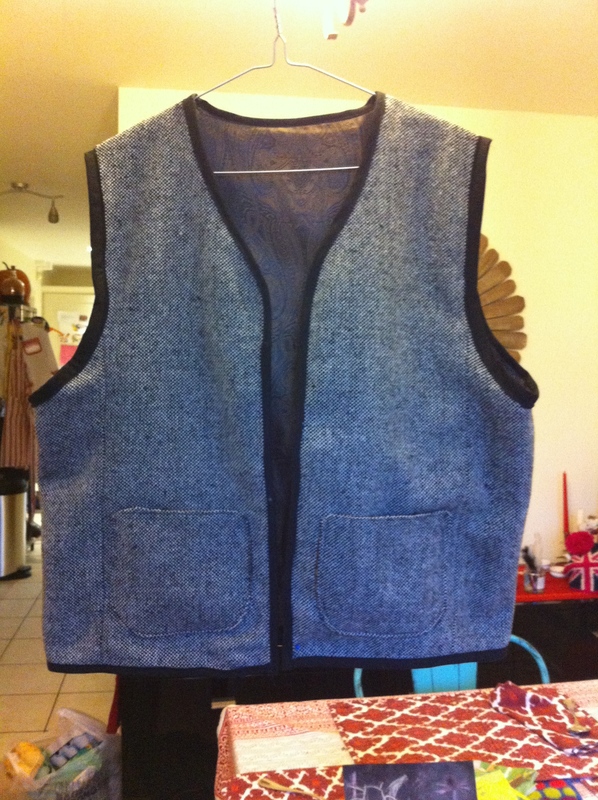 Working on this piece taught me a lot about sewing and gave me the confidence to use handwoven fabric in future. The iron-on woven interfacing is key. 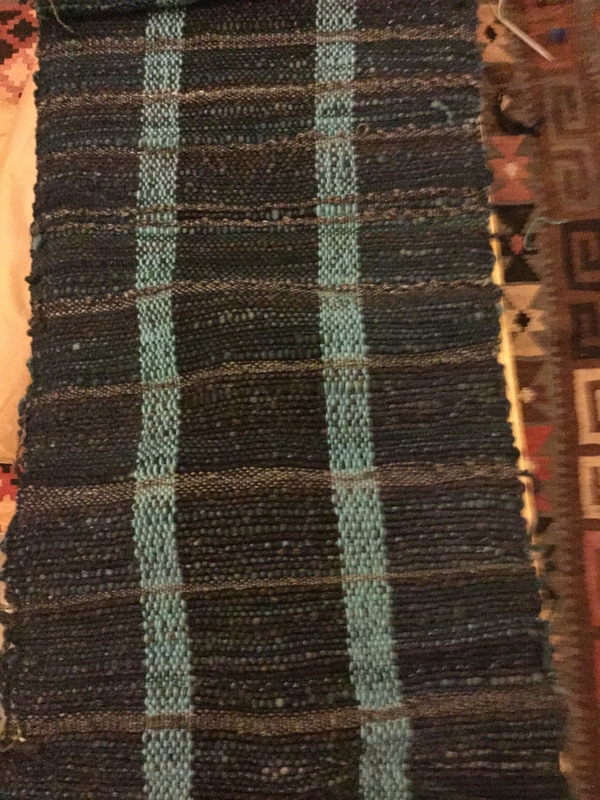 I have woven many oblongs now for scarves, table runners, cushion covers etc and am now ready to try this! Thanks for your top tips! I hope to create a paper pattern from an existing well-worn tunic; I hope it works! Hi Ruth. Let us know how your garment turns out! The iron on woven interface is key as is finishing off the cut out pieces with a zig zag stitch! hi ruth, great find, thanks for posting this. i have this fantasy about making myself a jacket but i too am worried about the seams and general chunkiness. i am using upcycled fabrics to weave with so nothing fine about it! i dont like the saori style patterns i see and thought to use a simple dressmaking pattern. did you stabilise the entire piece with iron on interfacing? i have 2 pieces to chop and practice on before starting to make fabric i want to use but somehow cant make a decision what im going to make to practice!! I used the iron on woven interfacing on the edges only. It is essential to prevent fraying and to have something to sew on. Machine sewing a chunky handwoven fabric can be tough. Some people join pieces using crochet. It looks great. Do you pre wash the woven fabric before interfacing and sewing? Yes. Usually washing or fulling the cloth is the last step in the weaving process. It is hugely important to wash your handwoven gently before getting ready to sew. It’s also really important to account for shrinkage before you begin to weave to make sure you’ve got enough fabric. The rule of thumb is to figure in 30% shrinkage. Of course that will vary depending on how you finish your fabric and what materials you use to weave.